Discussion in 'Developers' Corner' started by wardmundy, Aug 24, 2016. We've put up the final release image of Incredible PBX for XiVO. It works only on the Raspberry Pi 3. Don't even attempt it on a RasPi 2. XiVO requires a lot of resources, and the RasPi 2 simply does not have the necessary horsepower. The 1.3GB image and a Mac script to create a microSD card from the image are both available on SourceForge. Be sure to use at least an 8GB microSD card, preferably 16GB or larger. Don't even waste your time without a Class 10 card! Special thanks to Iris-Network for the original Raspivo - XiVO build. XiVO 16.10 with Asterisk 13.10.0 now available Newer build with WiFi and Bluetooth support available after 4:30 p.m. EDT, Sunday, 08/28/2016. 7. After install completes, add trunks and inbound and outbound routes as desired (see below). NOTE: Google Voice scripts to add-gvtrunk and del-gvtrunk are preconfigured and ready to run in /root. To get started with other trunks, point a web browser to the IP address of your PBX. Login as root with the XiVO GUI password you set up above. If you ever forget your password, you can run /root/admin-pw-change to reconfigure it. Basically, this install is the same setup as the one for VirtualBox in this week's Nerd Vittles article. 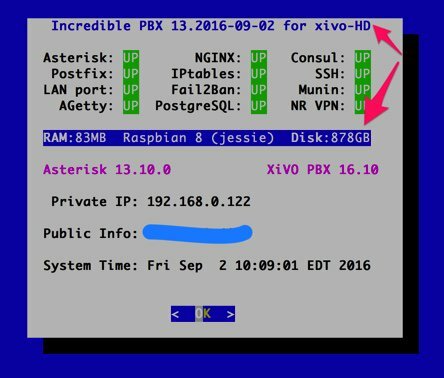 The original Incredible PBX for XiVO tutorial is here. New build with rock-solid Asterisk 13.10.0 and XiVO 16.10 combo is now available on SourceForge. Setup/design details in first post above. Special thanks to Iris-Network for the original Raspivo - XiVO build. export PGPASSWORD='proformatique'; psql -P pager=off -U asterisk -d asterisk -c "SELECT host,callerid,name,secret FROM usersip order by callerid"
Final build before official release should be available on SourceForge after 4 p.m. EDT, Sunday. This build adds WiFi and Bluetooth support. Turn off the logs to preserve your microSD card. Tutorial here. Special thanks to Nick Pettazzoni for the latest fixes!! Complete pygooglevoice documentation here. For those that want the Google Voice command line interface as well as SMS messaging for Incredible PBX for XiVO, here's how to update your build. NOTE: This software already is installed with Raspberry Pi builds on or after 20160828. New Incredible PBX for XiVO build for Raspberry Pi 3 now available on SourceForge. Exciting times! Xivo = happy, Pi3 = nice performing platform. But where can I get on the train? Seems there are new and desirables coming out almost daily. How easy or difficult are updates to apply as script patches afterwards or during the automagic update during the boot? ie. I have the version with the logs on and now want to turn them off. And, now would like to add some of the above in the 9 am release. Most of the updates are referenced in this thread or this one, and we'll add the missing ones shortly. If you're worried about wear and tear on your microSD card running Incredible PBX for XiVO, the simple solution is to install a USB drive. A hard drive or thumb drive will work but thumb drives also wear out quicker than hard drives. Keep in mind that a RasPi always has to boot from a microSD card so keep this card in the Raspberry Pi at all times! 4. Boot the Raspberry Pi 3 from the microSD card. Don't plug in the USB drive just yet. When the reboot completes, you should be running from your USB drive if all went well. Wait a full minute after the reboot finishes before logging in as root. Complete Phase I of the Incredible PBX install, skip the expand image step (since it won't work), and reboot. Wait a full minute after the reboot finishes before logging in as root. Complete Phase II of the Incredible PBX install. Then exit from pbxstatus to the CLI. ALWAYS wait a full minute after a reboot completes before logging back in as root! Why the "not USB 3.0!" warning? I don't know of any issues with USB3 drives on a Pi. I haven't bought USB2 anything for quite a while. Even WD's "PiDrive" is a USB3 drive. With virtually no price difference better to future-proof. Of course, the Pi will only be capable of USB2 speeds. Login to the SAMBA share RasPi3 as pi with the password you assigned. The thread completely off point. It is talking about making the Pi itself a USB3 device, not about using a USB3 drive. Obviously the Pi itself is a USB2 device, but any USB3 compliant drive will work. Folks don't need to buy outdated tech when purchasing a drive. Buy what you think is best. The RasPi 3 has four "outdated" USB 2.0 ports. If you're going to use an external drive with it, I'd use a USB 2.0 drive because many USB 3.0 drives cost more and you only get USB 2.0 speeds, but to each his own. Some USB 3.0 drives only come with a 3.0 cable which won't work in a 2.0 port. I would also expect 3.0 drives to draw more current since they have better processors to support faster performance, but I haven't researched whether that is the case and, if so, whether you would also need a powered USB hub in addition to the drive. Is there a way to upgrade in place from 20160828 to current or do we need to burn a new image? You can manually add the new components following the tutorials here. drive is of course not compatible with the 2.0 mini-USB receptacle, but the other end (I think it is called an A-connector, it's the one with the rectangular plug) fits into the 2.0 receptacle on the SheevaPlug fine. I'm not sure if a standard USB2.0 cable would work -- it looks like it might, but I haven't tried it. How worried should I be in practice about the MicroSD cards "wearing out" with XiVO in 24/7 Ward? For me personally the idea of using "spinning rust" with the Pi 3 goes against the simplicity, reliability and low power consumption of the Pi concept, but each to his own of course! My own habit with the Pi's is to buy cards in pairs and being mainly Mac-based for my day to day stuff I do full image backups and copies using the ApplePi-Baker utility. Maybe I've been lucky so far and should be more concerned about SD cards failing? P.S. Googling SD card wear issues I see references to using something called "tmpfs" and tweaking various parameters to reduce writes of various logs and so on for on Linux-based systems to extend life of SD cards ... would this be a feasible approach to get XiVO on Pi optimally "tuned" for longish card life?